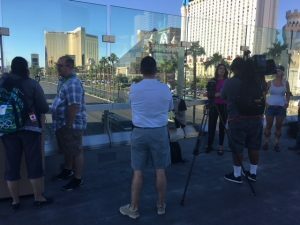 A few hours before the Las Vegas shooting, I checked-in at the Monte Carlo, four ‘doors’ down from Mandalay Bay. I was there to attend the DUI defense seminar presented by the National College for DUI Defense (NCDD). 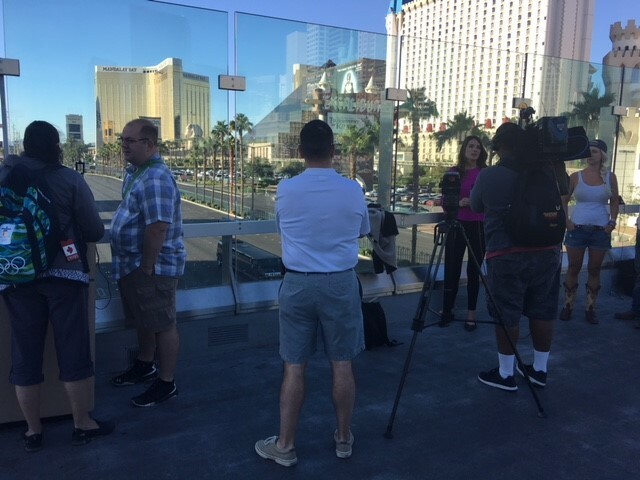 The desk clerk said the Monte Carlo was being renovated (no pool, no spa, nearly no restaurants), and she offered to move me to Mandalay Bay. I decided to stay at the Monte Carlo and just use the pool at Mandalay Bay. My body was still on Ohio time, so I was going to bed when the shooting started. I was aware there was a lot of noise (apparently, the Monte Carlo was locked-down), so I put in earplugs and went to sleep. 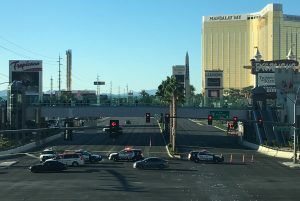 The next morning, I woke up and learned the nation’s largest mass shooting took place just down the Strip. Still on Ohio time, and traveling with an Ohio police officer, I walked down to the area. Witnesses were returning from police interviews: draped in hotel towels, crying, and wearing outfits obviously selected for a country music concert. News reporters, like the one pictured here, were reporting on the incident from every angle. And then there was the police presence. 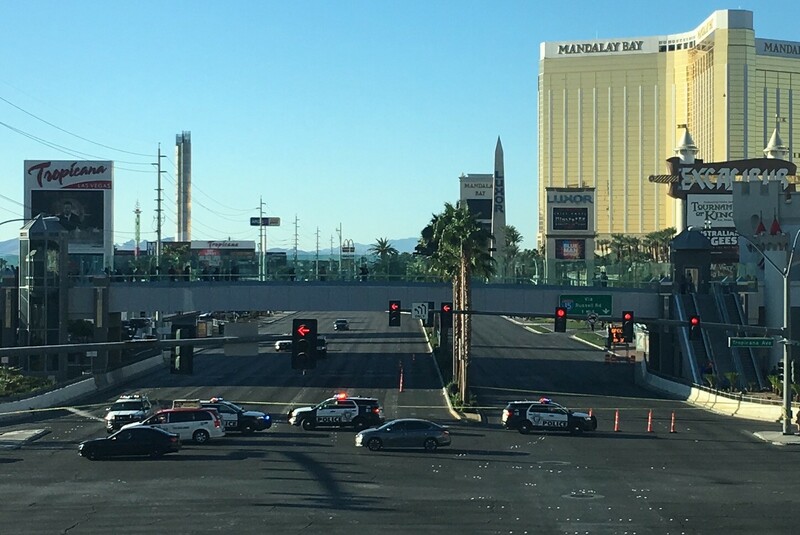 Law enforcement had Las Vegas Boulevard shut down south of Tropicana Avenue. 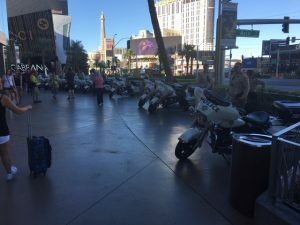 Police cruisers and motorcycles lined Las Vegas Blvd. from one end of the Strip to the other. Groups of officers were stationed outside each resort. The atmosphere was definitely not the typical Vegas vibe. For the next couple days, it was sobering, surreal and somber. The feel gradually changed throughout the week. The incoming tourists seemed ready to party, as usual. For the locals I talked with, however, there was still a heavy feeling when I left. The police presence gradually reduced throughout the week. A couple days after the incident, cruisers and motorcycles were still parked along the Strip, but only here and there. Officers were still stationed outside the resorts, but fewer of them. I repeatedly heard pedestrians thanking officers for the presence and service. The gratitude shown to the officers was not the only kindness I observed. 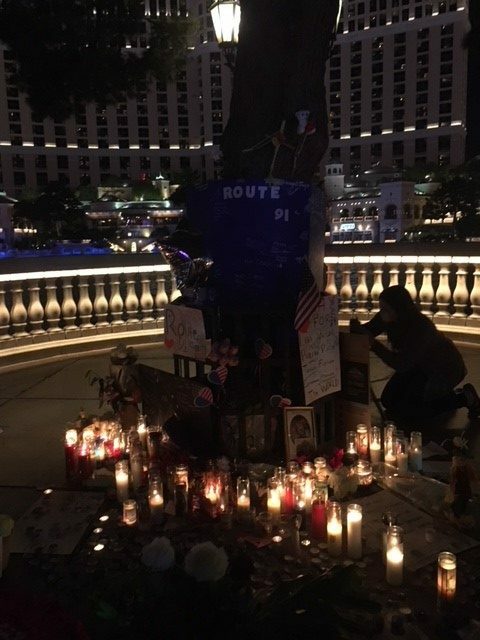 I saw local residents comfort each other, I saw tributes to the victims like the one pictured here, and we all saw reports depicting heroic efforts of both first responders and brave civilians. Each day at the seminar there was a moment of silence. Despite the somber vibe on the Strip, it seemed like people were generally nicer to each other. A tragic incident like that puts things in perspective, makes people appreciate life, and affects how people interact with each other. It probably won’t last, but it was good to see our capacity for compassion. 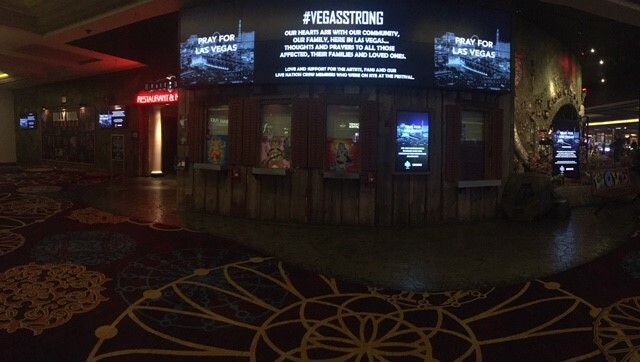 One sign at Mandalay Bay was particularly moving. I went there a couple days after the incident, and it was nearly empty. 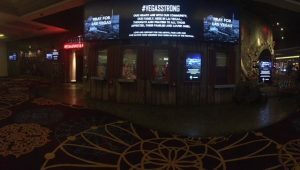 Outside the House of Blues, one of my favorite places, were screens showing a photo of The Strip with these words superimposed over the photo: “PRAY FOR LAS VEGAS”. I do pray for Las Vegas, the victims’ loved ones, and our nation.